4 fixing holes. Can be bolted to the ground. Can be fitted with reflective bands. 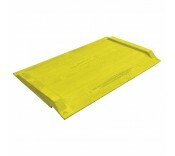 Anti-Slip p..
Complies and exceeds the ‘Wheel Chair Boarding Ramp Specification’, the ‘Safety at Street works, ..